I wanna know who watched, "Trading Spaces" back in the day? Do you guys remember that show? I used to absolutely loved it. I always envisioned being the designer and thought that would be so much fun! And could you imagine having a guy like Ty on hand to build you whatever it was you needed? Well, I'm toying around with an idea. I've been thinking about starting a Youtube channel featuring budget makeovers. I think it would be a great space to broadcast my coatings and try my hand at decorating for others. Of course I can't trade spaces with 2 homeowners, but I can redo your office or home. Especially if you're a doctor, dentist, or lawyer. Those offices always need work to get hip. Anyways, if you're in the Florida Keys area, and you have a $6,000 budget, email me. As we release new products, it gives added ability to recreate even newer, beautiful store bought looks. I love giving the client the ability to create colors this gorgeous in their own homes. 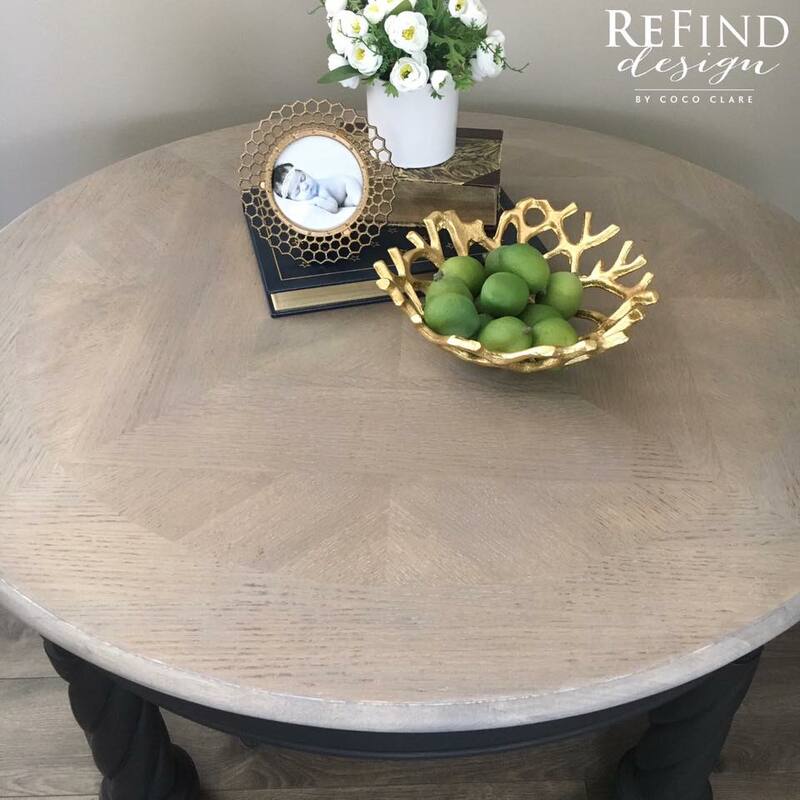 Today, it's all about turning this oak table into a beautiful reclaimed-looking table like Pottery Barn's gorgeous Reclaimed Parquet Table. Painted Pearl's Coatings Furniture Paint: Color "Nack"
1.] SAND: Here's the labor portion. You want to use a palm sander and 80 grit sandpaper to make sure the wood is completely down to raw. 2.] 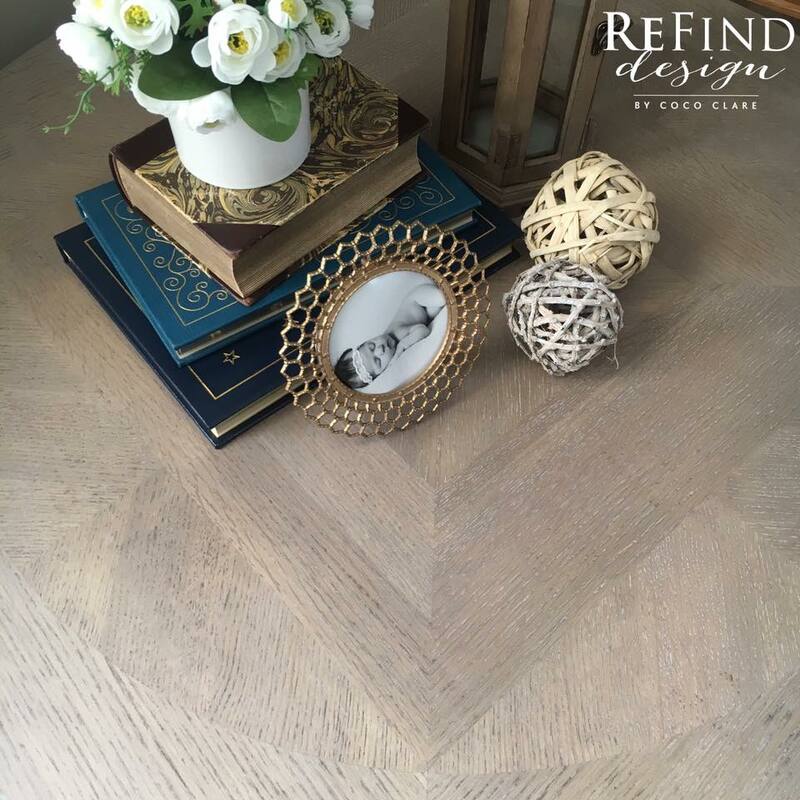 STAIN: Weatherwood released a new stain that can turn oak into a beautiful light brown, called Restoration. This product can work on any wood, so it's less complicated than some of their other products. You should apply this product with a sponge brush, let it dry naturally. Do not wipe it back off. 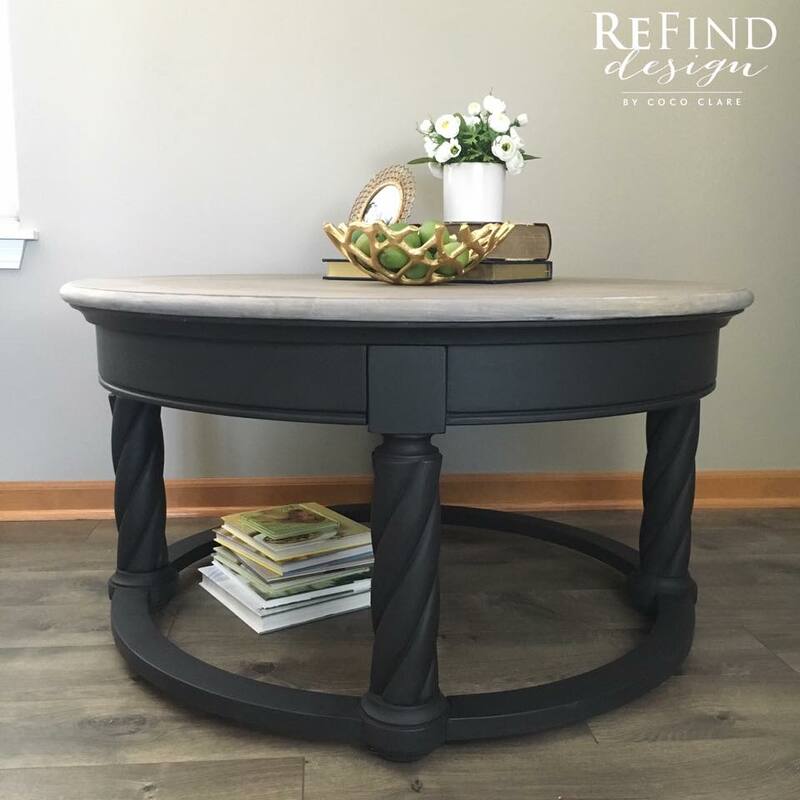 As the wood stain dries, the wood becomes oxidized and it turns a beautiful warm gray brown. You can see this for yourself, in the above video. 3.] LIGHTEN: If you want to lighten the look, you can add a coat of White Maintenance Oil. It adds the look of patina and is just generally gorgeous. Simply brush or wipe onto wood, allow to sit 3-7 minutes. Then wipe off with a clean cloth. Or you can watch the video above. 4.] PROTECT: To protect the wood, you can use Weatherwood Varnish. That can be applied right over the stain and maintenance oils, as long as they're completely cured first. You can apply 1-3 coats of varnish based on the level of protection you need. 5.] 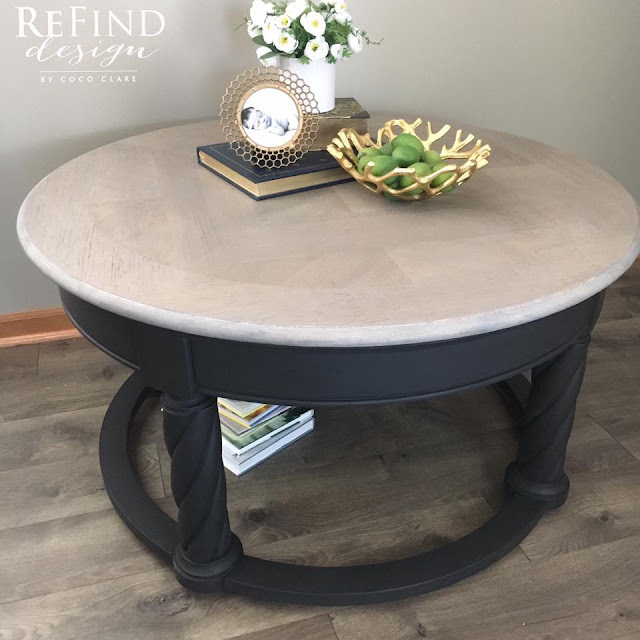 PAINT: The Base was chalk painted with Pearl's Coatings Furniture Paint: Color "Nack". It's a 1-step furniture paint that can be applied over other coatings. 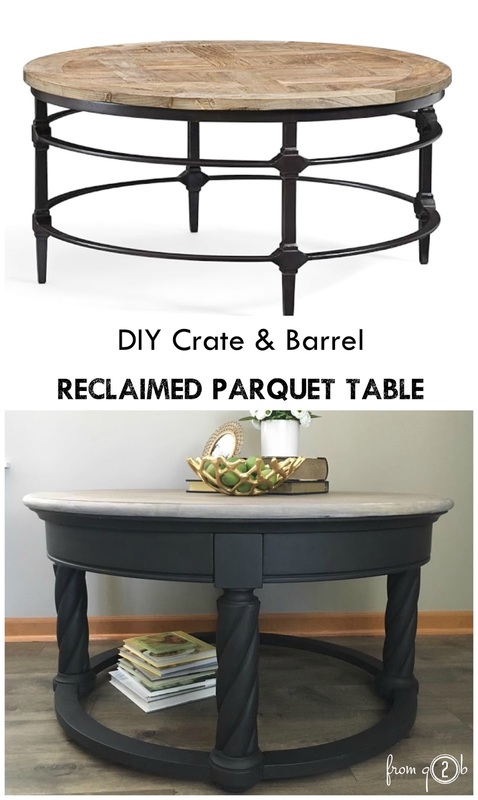 Last week I introduced you to Light Oaking stain on the DIY Restoration Hardware Reclaimed Gray Oak Table on any wood and here's Restoration for the Crate & Barrel Look! I hope you liked them. Let me know if you have questions! !